It Is Not Good That Man Should Be Alone is a compilation of three works written by the author in the sixties and seventies for its large number of writings. This was the great and determining era of the struggles for civil rights in the United States of America, as everybody knows nowstruggles which were also the lot of the author in a very particular way that inspired these fifty-seven poems and … the play. 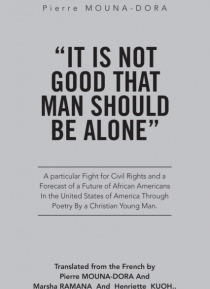 This illustrates a Christian romantic poetry of the civil rights struggles. Translated from the French, the long-ago published works by the editions Saint-Germain-des-Prs, which are Harmonie Reversale and Le Pas de lAube, have been revised and augmented. The play, titled in French jirai en Alabama (Ill Go to Alabama), is facing here its first publication. All three works want to bear witness to the sentence in the preface of Give and Take Harmony, stating that racism can be defeated and is indeed defeated, and, I can add, is defeated through love in its fullness to wit, appeal, and reciprocal feelings, then marriage as conceived by the God of true Christians, thus opening the way to sexualityall that expressing the necessary bond of Adam and Eve. This can be characterized in Give and Take Harmony by the poem Blues for Peggy in Its Time for Alabama, by the biracial love between Molly, the white young lady, and Guemby, the African student at Howard University; and in Dawn Step by The Banquet, to which the children of Americablack, white, and grayare invited to the communion of flesh and blood and of bread and wine, which necessarily makes true the dream of the Rev. Dr. Martin Luther King Jr. Besides the three prefaces of the three works and the postscript of the book the reading of which is a mustit brings to light the motivation and the aim of the authors endeavor for a harmonious multiracial society in America. The author, P. Mouna-Dora, besides writing poetry and songs which can be Christian and romantic like those found in the book, enjoys reading, music, and sports.